DESIROUS of self-knowledge and out of a conviction that a householder's life was a hindrance to it several people leave their homes seeking a guru's grace . Yet destiny being insurmountable and possibly because going through the householder's stage was necessary in their cases, either because of their past karma [?] or their being not fully ready, they have to continue playing the householder's part. This observation is very much in evidence in the case of Natesa Mudaliar. Natesa Mudaliar was a teacher in an elementary school. A little after he setup his home, he chanced upon the book, `Jnanatirattu', a Tamil version of Swami Vivekananda's `Jnanayoga'. That book fired Mudaliar with vairagya [?] at a time when he had just commenced his conjugal life. He then thought that `self knowledge' was impossible without a guru and began an earnest search for one. that it would be impossible to become a disciple of the Maharshi and so returned home disappointed. But he did not leave his search. He thought of several other well known sadhus but in no case did he feel attracted. He despaired of attaining mukti [?]. Keeping in view that one who died at Kasi would attain mukti, he set out on a journey to that holy place accompanied by a friend. At Sri Perumbudur another devotee, a bachelor, became his acquaintance. The devotee admonished Mudali for deserting his young wife who had left her parental home to live with him. Thus he persuaded Mudaliar to return home. Two more attempts of Mudaliar to go to Kasi did not succeed for some other reasons. In 1920, Mudaliar wrote a letter to the Maharshi saying " I had the privilege of having your darshan sometime back, but you have not showered your grace on this unfortunate one. Ramakrishna Paramahamsa invited one and all to share the sweetness of the bliss enjoyed by him. You have attained mukti [? ], Sir, but is it fair to leave the likes of me who are caught in the wild fire of samsara to our fate? I beg of you to let me know through a letter if I can come to your presence. I shall be there at once." A month passed by but there was no reply. Then Mudaliar sent another letter by registered post in which he said: "I am convinced that you are my refuge if not in this birth in a subsequent one. I am determined to have you as my guru if not now, subsequently. You will have to be born again for my sake." A few days later the Maharshi appeared in Mudaliar's dream, in which he said to him: "What is the use of your meditating on me? Meditate on Easwara who is mounted on the bull, Nandi. Once you get his grace my help will follow." Then onwards, Mudaliar commenced the prescribed meditation. Meanwhile he got a letter from an inmate of Bhagavan's ashram, Vasudeva Sastry, saying " Both of your letters have reached us. Bhagavan never gives a reply to letters. You may come and have his darshan". After he enquired about Sastry and his relationship with the Maharshi, Mudaliar went to Arunachala, He first had the darshan of Arunachaleshwara and spent that night in the temple precincts. A Brahmin saw Mudaliar and after finding out the purpose of his visit said "It is fine that you have come, but let me tell you my experience. For over sixteen years I have been yearning for the Maharshi's grace but with no luck. I am doubtful if your experience will be any better. He is completely indifferent and never says anything. He is not at all moved by visitors. Your going there is a sheer waste". Mudaliar did not like this, but the Brahmin persisted saying, "But there is a Mahatma by name Seshadri Swami close by. He also does not allow anyone to come near him and flings stones at them. Yet you may go and try your luck with him. If he responds kindly, you have a chance". Mudaliar agreed to this course of action. But to locate Seshadri Swami was not at all easy. Mudaliar felt the heat of the outside sun as well as the heat of his interior, which was one of doubt. Iyer asked Mudaliar to wait at a particular place and went by himself to look for Seshadri. After sometime he came back to Mudaliar, accompanied by Seshadri Swami, on seeing whom Mudaliar felt it was a good augury. All on a sudden Seshadri asked Mudaliar "What is that you can give me?" Mudaliar at once placed in his palms the jack fruit pieces he had. After eating them, Seshadri began walking away towards the market place. Mudaliar and Iyer followed him. "Won't you buy me some mangoes" asked Seshadri. At this, Mudaliar's enthusiasm doubled at the thought that the Mahatma was thus giving him an opportunity to serve him. Seshadri ate some mango pieces, and distributed the rest to the people surrounding him and later asked for water. Iyer went out to fetch water. Seshadri turned towards Mudaliar and said "What a pity! Why suffer like this? After all, what is jnana [?]? Whatever remains with you after you mentally reject everything as being impermanent is jnana [?]. God is that. It is madness to visit all sorts of hills and caves in the hope of acquiring jnana [?]. Have no fear and go". Seshadri turned to go away by which time Iyer brought water. That was on 2nd May 1920. Taking this to be a harbinger of good things to come Mudaliar and Iyer left for the hill that very afternoon in the hot sun. They sat in the presence of the Maharshi for well over five hours, but he did not utter a single word. Dinner time was nearing and Bhagavan was getting ready to leave. At that time Iyer pointed out to Mudaliar and said to the Maharshi. "This is the person who wrote two letters". The Maharshi looked at Mudaliar a couple of times but said nothing and left the place. Mudaliar went back. Thereafter Mudaliar kept visiting the ashram every month. Though he watched several visitors plying the Maharshi with questions he could not bring himself to ask even a single question. A year passed this way. During one of these visits, Mudaliar asked Bhagavan "People speak variously about Bhagavan's grace. I would like to experience what it is really like." Bhagavan replied "I have always been giving you grace if you do not understand it what can I do?" Mudaliar interpreted this as an indication that Bhagavan's being in silent Samadhi was in itself his grace towards people and that for seekers the ideal was to attain a state of mouna [?]. But that state of mouna [?] was not clear to him yet. Some instructed that the mind should concentrate on one matter but as this was contrary to what Tayumanuvar said, namely, that "there should be no ideal in dhyana [? ], the mind itself should vanish" those instructions did not appeal to Mudaliar. I had a dream where both my father and the Maharshi figured. Pointing out my father the Maharshi asked me who he was. I replied hesitatingly "My father" though I was conscious that I was not speaking of the true nature of the relationship. Maharshi smiled approvingly and said "That is true only from a worldly stand point but not from the absolute stand point, isn't it? Didn't I say that I was not the body?" Saying this, the Maharshi drew me close to him and placed his hand on my head and later he pressed on the right side of my heart with a finger. It pained a little but I bore it as his grace. least in my next birth". The Maharshi observed him and after the visitors left said to him: "Why are you so sorry? What you wish to obtain is with you already. Will anyone ask for something already available? Even if you feel that it was not clear to you now, won't it be so a little later? Why be depressed about such a minor matter? If really you do not deserve to learn it, how come you have this desire to have the darshan of Mahatmas?" With this Mudaliar felt a little relieved. Mudaliar was convinced that his life as a householder was a hindrance for his spiritual advancement and so in 1926 sought Bhagavan's permission to take to sannyasa [?] (Renunciation). The Maharshi dissuaded him saying that any number of impediments could arise even in a forest and that just as he would not think of family responsibilities in an ashram he should live without any thought of them in the house also. The Maharshi similarly dissuaded him on two more occasions. It was not that the Maharshi was unaware of Mudaliar's ardent wish, so he appeared to Mudaliar's wife and brother in dreams and told them that Mudaliar had his grace and that the family members must help him achieve his objective. They also fell in line. 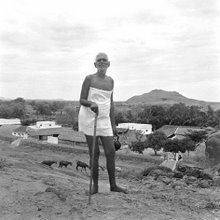 As a first step, Mudaliar gave up his job, he stayed at Arunachala and in 1929 took to sannyasa [?] with the name Natanananda Swami. A few years later, owing to certain developments, he had to resume the householder's role. them are Ramana Stotra Manjari, Ramana Stotra Shodasam, Ramana naan manimalai and Ramana Sataka. In all these hymns Natanananda described his questions to the Maharshi and the latter's replies. He used also to compose Bhagavan's answers to questions of other disciples and show them to Bhagvan concurrently. This compilation was published as Upadesa Manjari.